Make Your Own Sweet Candy Christmas Tree Decoration! Modern interiors often demand simplicity and a lack of clutter, but at Christmas these mantras get forgotten and many of us decorate every surface in sight. One of my favourite decorations has to be my Sweet Candy Christmas Tree. 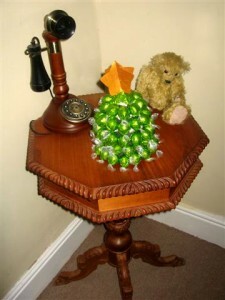 Incredibly easy to make, it’s the perfect craft for children and makes a wonderful table centre or side table piece. Plus it has the added benefit of being edible once the festivities are over! First you need to make the base of the Christmas Tree. This is done by drawing around something circular, I used a medium dinner plate. I wanted two layers to my tree so drew out two circles, but one larger circle would work if you only require one layer. Cut out the circle(s). 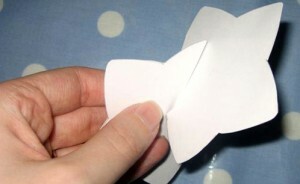 Cut a slit in one side of the circle, this should reach from the edge into the centre. 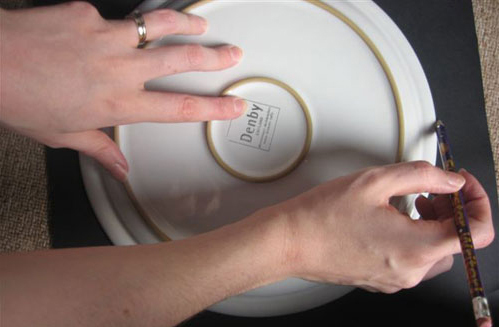 Grip both sides of the slit and form the circle into a cone shape. Secure the shape with tape. 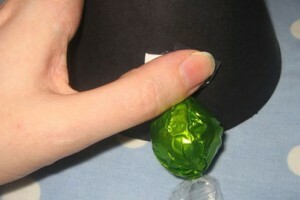 Cut out some double sided tape and attach to one edge of a sweet. 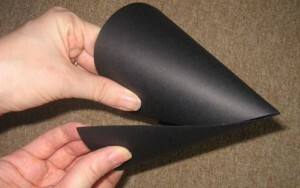 Peel off the other side of the tape and stick to the bottom of your cone. Continue sticking sweets in a line at the base of the cone. When you reach the first sweet begin another line just above the first. Make sure you cover up any tape and leave as few gaps as possible. If you are creating two or more layers remember that the bottom layer will not need as many sweets as the top. Unwrap one sweet and use the wrapper to cover the point at the top of the tree. 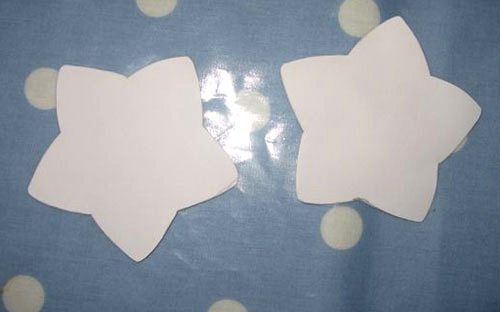 Next draw and cut out two simple stars from cardboard. Cut a slit from the top of one of the stars into the centre. Then cut a slit from the bottom of the other star into the centre. Slide the two stars together to make a 3D shape and paint gold. Once dry stick to the top of your tree. If you have more than one layer to your tree place them on top of each other now. Ta Da! You have made a beautiful and edible Christmas Tree! TIP. If you can’t find green sweets don’t worry, these trees look great in multi colours. 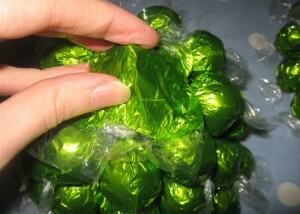 Or you can decorate primarily in green with the occasional coloured sweet as a bauble! 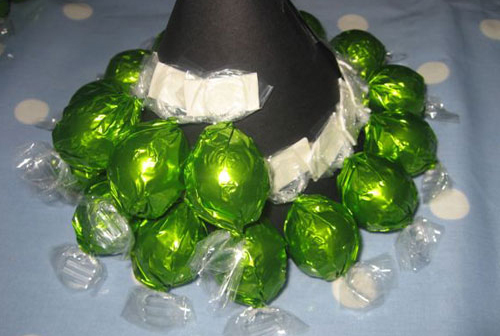 This entry was posted in Tutorials and tagged candy tree, Christmas, christmas tree, craft, edible decoration, edible tree, festive, make, make your own, sweet tree, table centre, toffee, tree, tree decoration, tutorial, xmas. Bookmark the permalink. 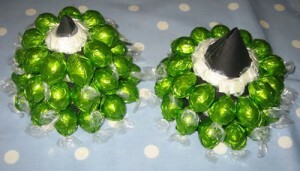 2 Responses to Make Your Own Sweet Candy Christmas Tree Decoration! I love this idea, brilliant for the kids! These are in fact impressive ideas in regarding blogging. You have touched some pleasant points here. Any way keep up wrinting.